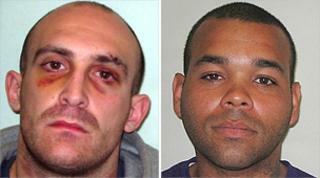 Two men convicted of murdering a man outside a prison in south London have been jailed for life. Rupert Ross shot Darcy Austin-Bruce, 20, five times as the victim was visiting an inmate at Wandsworth Prison in May 2009. Ross, 30, and Leon de St Aubin, 34, the getaway driver, were both found guilty of murder at the Old Bailey. Ross and St Aubin, both of Fulham, west London, were each jailed for a minimum of 30 years. The jury heard Ross, who came from a wealthy family and went to private Dulwich College, escaped with his accomplice on a stolen moped after the shooting. The killers and Mr Austin-Bruce had been friends and were involved in drug dealing but they had fallen out, the court was told. Judge Martin Stephens told the killers: "You both carried out a well prepared and meticulously planned execution of a man who had become your enemy. "You both dressed in what would pass as lawyer's clothes so you did not draw suspicion." He said the pair had made some effort to change their lives but "when a situation arose that you thought required revenge by killing, you carried out this monstrous attack". Prosecutor Crispin Aylett QC said: "The killers had been tipped off by someone inside the prison." Ross had dressed to look like a lawyer visiting a client but was also wearing a crash helmet. The court heard Ross had been in trouble with the police since the age of 16 and had previous convictions for theft, burglary and drugs offences. Stuart Trimmer QC, defending, said Ross had a good education and a loving family but was caught up in a "depressing cycle relating to drugs". In his diary Ross wrote about "living a gangster lifestyle, making good money and living a fast life". Following the sentencing, Acting Det Ch Insp Brian Lucas said: "These men believed that they could get away with killing a man in broad daylight as revenge for a petty argument. "I believe that they had lost sight of reality and now face the consequences of their sad and violent choices."